2011 N.C. Turnpike Authority Annual Report: $580 million. November 2011 Report to the J.L.T.O.C. : $665 milion: Note: Cost jumps $85 million. 2012 N.C. Turnpike Authority Annual Report: $550 Million. Note: Cost drops $115 million. October 5, 2012 Report to J.L.T.O.C. : $651 million. Note: Cost jumps back up $101 million. 2013 N.C. Turnpike Authority Annual Report: Preliminary cost estimates for the project are between $470M and $600M. Note: Cost drops $51 million. 2014 Annual Report N.C. Turnpike Authority: New legislation was passed in North Carolina (House Bill 817-An Act to Strengthen the Economy through Strategic Transportation Investments) and was signed into law on June 26, 2013. The new law includes the creation of the Strategic Mobility Formula and includes changes to the annual appropriations (GAP funds) dedicated to the NCTA projects. The Strategic Mobility Formula is a new way to fund and prioritize transportation projects to ensure they provide the maximum benefit to the State of North Carolina. 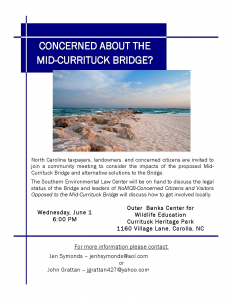 The annual appropriation of $49 million for the Triangle Expressway ($25 million) and Monroe Bypass ($24 million) projects remains under the new law while the annual appropriations for the Mid-Currituck Bridge and Garden Parkway projects were removed. November 2014 the federally approved STIP cited a cost of $621 million. Note: Cost jumps back up $35 million. 2015 N.C. Turnpike Authority Annual Report: No cost estimate provided. 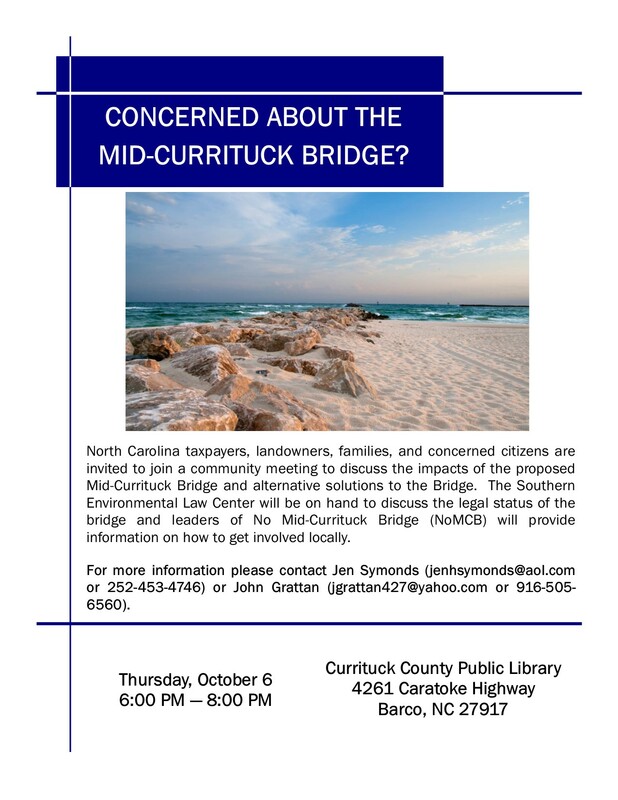 There are many concerned citizens and vacationers that support the SELC in their efforts against Mid-Currituck Bridge, an unnecessary, extremely expensive, and environmentally damaging project. The cost of the project has ranged from $750 million in a 2010 Letter of Interest for a federal T.I.F.I.A. loan to a “normalized cost” of $410 million for scoring purposes only during the P3.0 process. As recently as November 2014 the federally approved STIP cited a cost of $621 million. One month later the new draft STIP listed the cost at $475 million, $65 million more than the cost used for scoring. Now the NCDOT claims the project cost is $435 million. The Public Private Partnership has been cancelled and the annual $28 million per year “gap” funding has been removed from state statute. The NCDOT has not explained the drastic $200 million drop in the price tag so that’s why the lawsut. CHAPEL HILL, N.C.— The schedule for constructing the controversial Mid-Currituck Bridge—an expensive and environmentally destructive seven mile toll-bridge that would connect the Outer Banks town of Corolla with mainland Currituck County—has again been delayed. Last week, the North Carolina Department of Transportation confirmed that the project’s schedule was pushed back as the agency continues to study the need for the bridge and the viability of alternative solutions after new data showed a drastically reduced traffic forecast. The governor previously announced last November that the bridge project had been accelerated and construction would begin in the summer of 2017. New data obtained by SELC from NCDOT suggests that the delay might stem from questions about the need for the bridge and its financial viability. The new data show that future traffic volumes on the Northern Outer Banks are now estimated to be significantly lower than previously anticipated by NCDOT—in some instances almost half of earlier estimates. The new data raise serious concerns about the fiscal burden that will be placed on taxpayers if NCDOT moves ahead with the bridge. The bridge ranked low under the state transportation scoring system and only $173 million has been set aside to pay for the costly project. New estimates, however, place the expected cost of the bridge at up to $678 million—meaning that over $500 million may need to be covered by drivers paying tolls. With the new traffic numbers showing dramatically lower expected usage of the bridge it seems unlikely this revenue will materialize, raising questions as to who will pick up the tab. So far, NCDOT has failed to present any financial path forward for the project. SELC uses the power of the law to champion all the things you love about the South: clean water, healthy air, mountains, forests, rural countryside, and the coast. Today the Obama Administration released guidelines on how federal agencies should consider climate change when assessing proposed projects. The guidelines, which apply to all federal projects reviewed under the National Environmental Policy Act, will impact decisions involving everything from transportation projects to power plants, pipelines, and oil drilling. Until now federal agencies have been inconsistent in how they considered climate change in project reviews, often ignoring it completely. When reviewing any new project, the agencies must consider both the direct and indirect impacts of greenhouse gas emissions. For a proposed new highway, for example, federal agencies will need to consider the greenhouse gas impacts of building the highway, as well as the emissions that would result from additional sprawl or traffic. Perhaps most significantly in informing decision-making, agencies are now required to quantify and compare the climate changing effect of different alternatives, allowing the public an easy way to see which alternatives will have the least impact. SELC has commented on the adminstration’s draft guidelines multiple times as they have been in development the past eight years, particularly asking for a greater focus on transportation. In the Southeast, transportation is now the leading contributor to climate change-causing pollution. In addition to transportation, the guidelines have significant implications for coastal spending and development. The guidance specifically refers to transportation projects on coastal barrier islands, such as proposed bridges in the Outer Banks, and directs agencies to consider the consequences of rebuilding with sea level rise and more intense storms. It also discusses how chemical facilities near the coast could have increased risk of spills or leakages, putting local communities at risk. While draft versions of the guidelines had set a greenhouse gas emissions threshold to trigger consideration—something SELC urged against—the final version removed that and now requires climate change analysis for all projects. The timeline is a farce and NCDOT knows it! 1. There is no Record of Decision. No R.O.D., no bridge. 2. They are trying to fund 60% of the cost with toll revenue bonds and without the “gap” funding that was removed from statute, $28 million/year for 30-40 years; no private equity- the PPP was canceled last December; and no Federal T.I.F.I.A. loan all of which were needed to keep the tolls as $26 each way during peak travel times, the tolls will be vastly higher and will probably be cost prohibitive. 3. A Financial feasibility study still needs to be done to determine if the project is viable. The North Carolina Turnpike Authority annual report indicates that study won’t be complete until 2017 sometime, so the project has not been determined to be financially feasible. 4. A supplemental EIS needs to be done as the environmental documents are too old and inadequate. 5. There is no accounting for lawsuit delays which add at least 1.5 years+ to timeline. So Governor McCrory, whose signature Strategic Transportation Investments law to remove politics from transportation decision making, has reversed course and is now touting the poster child of politically polluted transportation projects – the very reason for his S.T.I. law in the first place.